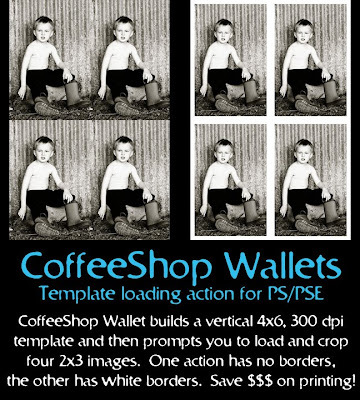 The CoffeeShop Blog: CoffeeShop Wallets - Templates! LINK FIXED!!! CoffeeShop Wallets - Templates! LINK FIXED!!! The psd templates are flattened and not 4 x 6. They are showing as .213 x .213 at 300dpi. nvscrapper, I just checked everything and all of the .pdf files are showing 300 dpi, 4x6, with layers. Did you unzip the file? Thank you so much for this Freebie. I want to let you know that I posted a link to your blog in Creative Busy Hands Scrapbook Freebies Search List, under the Photoshop/Gimp Resource(s) (Brush(es), Swatch/Palette, ...) post on May. 26, 2009. Thanks again. I have downloaded and unzipped and i have 2 folders with actions in them and in the one for elements - I have 2 actions, and 2- 64x64 .psd files, 2-64x64 .png files - NO, templates for 4x6. The only pdf file is the instructions. I have downloaded from 4shared...Did I miss something? Thank you! Your blog post will be advertised on the DigiFree Digital Scrapbooking Freebie search engine today (look for timestamp: 26 May [LA 07:00pm, NY 09:00pm] - 27 May [UK 02:00am, OZ 12:00pm] ). BIG fan of your actions! I love everything that you do! Thanks so much for these! Thanks for fixing the links, love the all of your actions and those templates are great! Thank you so much, it looks so cool! I love the amount of details you gave in your instructions through this article. Thanks for sharing. Your actions and tutorials are fantastic and your storyboards are so easy to use!! My brother is getting married next month and I used your wallet template to create favors for their reception. I saved them over $40 by creating my own wallets before printing!!!! So I just wanted to say thanks!! !